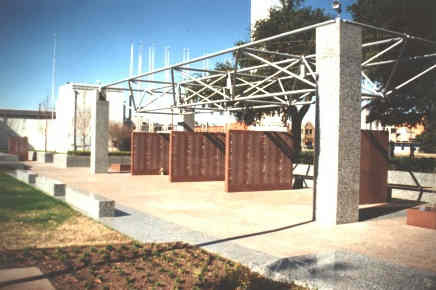 The Daughters of the American Revolution [ DAR ] in Dallas, Texas, erected a Vietnam Memorial. The memorial is located in Fair Park, near the DAR House, on a plot east of First, just south of Parry Street. You can follow the red DAR signs within the park. The site consists of 5 stone constructs. Four are arranged parallel to each other. The inner 2 have names on both sides while the outer 2 have names only on the side facing inward. Offset to the northwest of these is the final piece, which is a 'Missing in Action' memorial. ARE THE WOUNDS OF UNCERTAINTY. THESE ARE THE WOUNDS THAT CANNOT HEAL. THERE CAN FINALLY BE AN END. THEIR HEROIC SERVICE TO THEIR COUNTRY WILL NOT BE FORGOTTEN.